You purchased what you've hoped is a nice bottle of wine at the shop and when you get it to the dinner table, you carefully cut the top of the foil or capsule. At our annual holiday fest with some wine tasting pals, everyone brings, typically, an older, mature bottle of wine. And it's not unusual to find many of these have mold of some sort on the cork. Most of these bottles, by the way, are not "Two Buck Chuck." 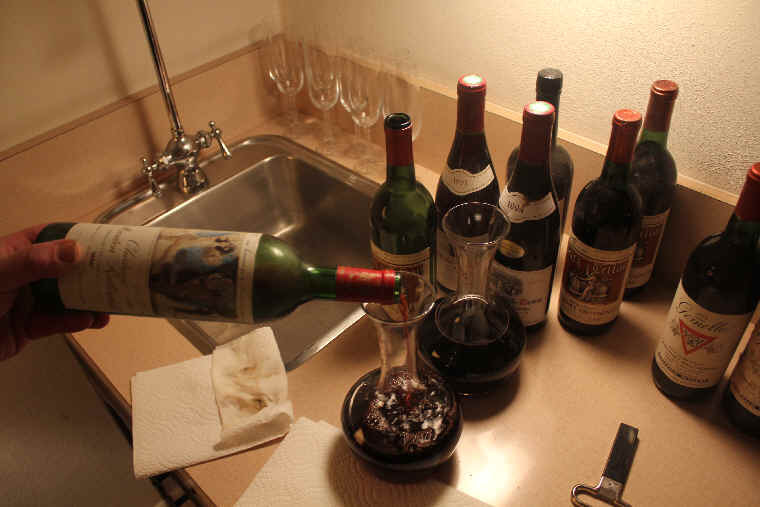 They're hugely expensive bottles of Bordeaux and Burgundy, but we've found the same sort of mold on bottles of older California wines, Sauternes, Vintage Ports, German wines and more. A DRC Echezeaux...a grand bottle of wine! And it was thoroughly delicious, too, by the way. Take a paper towel, napkin or cloth of some kind (even a Handiwipe)...moisten it with hot water and wipe the 'dirt' and mold off the cork. You'll get most of it. And, in any case, it's harmless and will not cause a nuclear meltdown or an outbreak of some contagion. 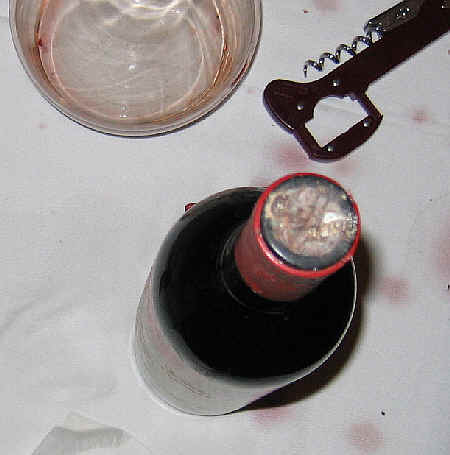 If your bottle is old, don't be surprised if the cork crumbles as you work on it with a normal corkscrew. That's why you should have a two-pronged cork-puller. 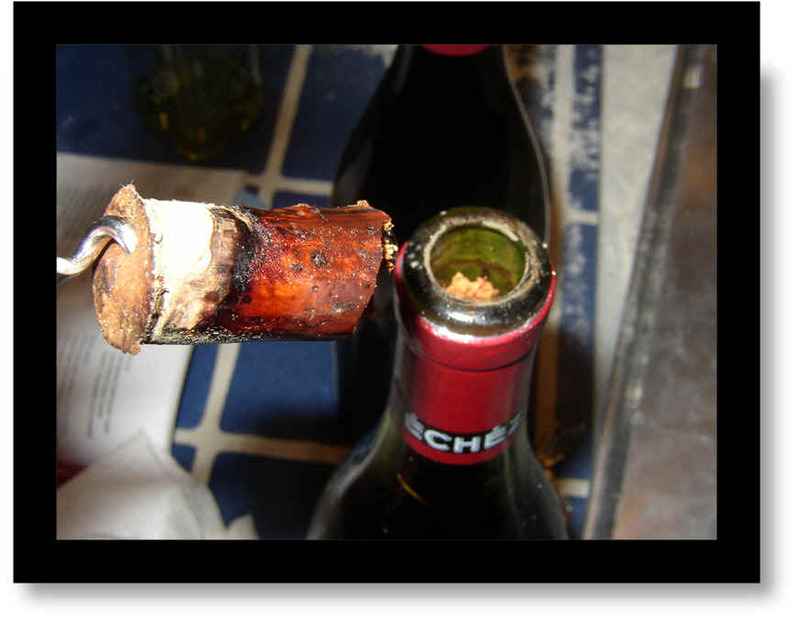 You have a better chance of removing the cork from an older bottle in one piece than if you use a corkscrew, which often bends the cork to the braking point. All the photos of wine bottles on this page were taken by me. All the bottles were opened by me. 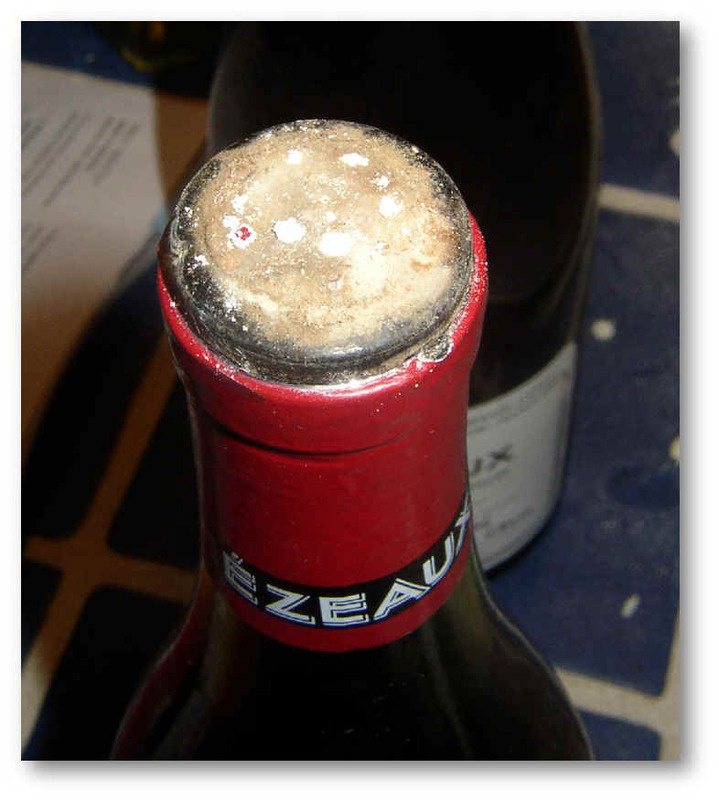 And in each and every instance, the wine was in good condition and not compromised by the mold on the cork. An entirely different dynamic takes place where wines are 'tainted' by a mold you won't see with the naked eye. It's called TCA or 2,4,6-Trichloroanisole if you want the long version. This little doozy accounts for the "corked" or musty character sometimes found in wine. It's also a bit of a problem in some coffee. TCA is a compound produced when various bacteria or fungi get together with chlorinated phenolic compounds. 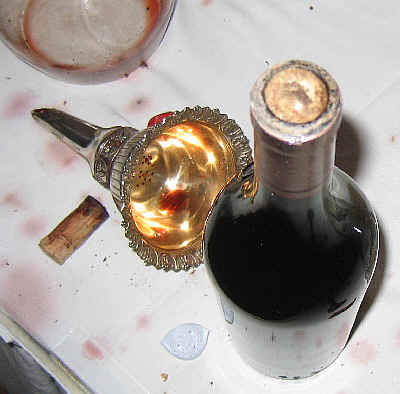 Often the problem is blamed on the cork closures in the bottle of wine. 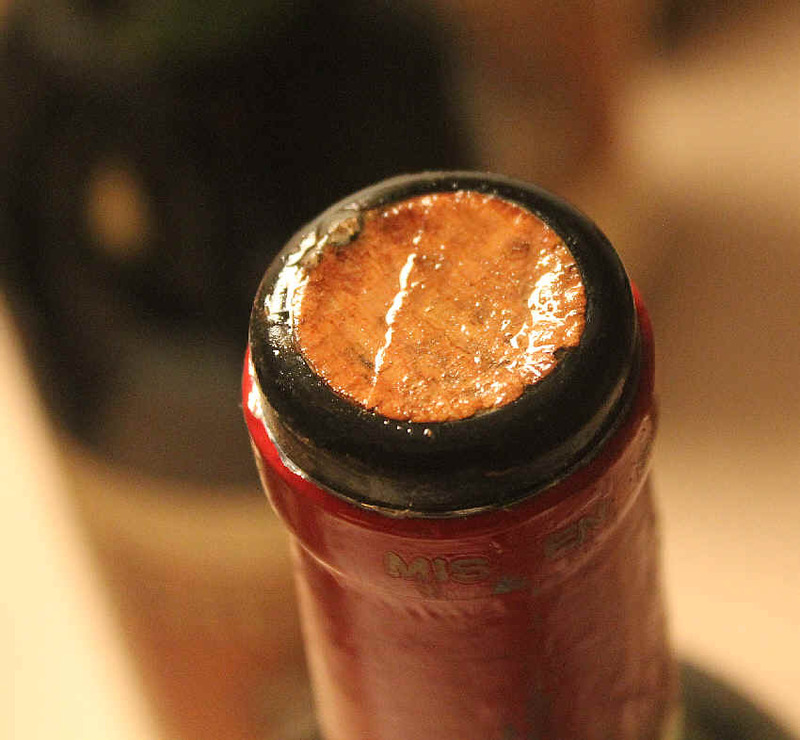 It's been estimated that somewhere between one percent and seven percent of wine bottles stoppered with "natural cork" are flawed. This, we're told, stems from the some usage of chlorine. It's possible the musty aromas come from the cork itself and some claim the TCA is naturally-occurring. However, there could be other sources of this problem, as a result of even cleaning the winery (barrels, wooden barrel racks, pallets, wooden beams in the cellar) with some sort of chlorinated product. At one point we'd hear that approximately 3% of the bottles sealed with corks were problematic. Cork industry advocates claim the problem is less than 3%, while some wine industry insiders claim it's higher. TCA is measured in parts-per-trillion and some claim it's not detectable by most people at 6 or 8 PPT. Others say some tasters notice it at one or two PPT! Some years ago we conducted a blind-tasting including some wines which had been tabbed as "tainted" by a major wine publication. Their "nose" was sure the problem was in the cellar of the winery and not a cork issue. The samples we included in our tasting were not cited by any taster as being flawed in any way, though the critic in question saddled the wines with failing scores since he found them to be defective. 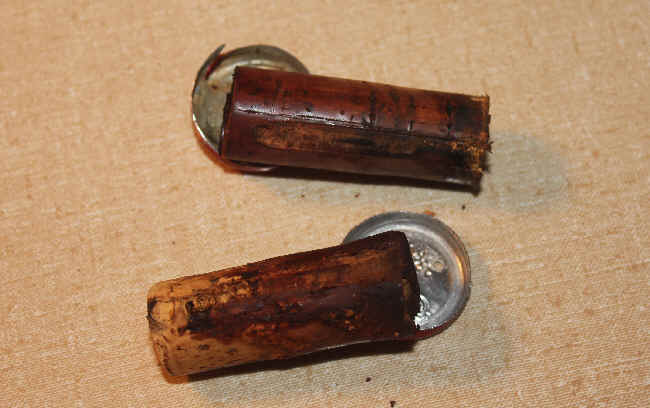 The problem is known as "corked wine" as people ascribe the problem to corks. In France they speak of bottles being "bouchonn�." In Italy you'll hear people use the phrase "sa di tappo" for a corked bottle. But the blame doesn't always lie with the cork closure. It's possible, as noted earlier, that the winery has an issue with TCA and may have a breeding ground for this musty character in the cellar. I'd read one report claiming a fairly common "fining agent", Bentonite, can be a source of contamination. If a bag of this powdery stuff, a clay essentially, is located in a place where there's some TCA or related compounds, it can absorb the TCA and affect the wine it's clarifying. I know from participating in a prominent wine judging that the staff members who organize the various flights of wine were amused when our panel asked for a "second bottle" of some wine we thought may have been corked. In fact, as it turned out, the wine in question had been in a "BIB" format (bag in box...no cork!) package. 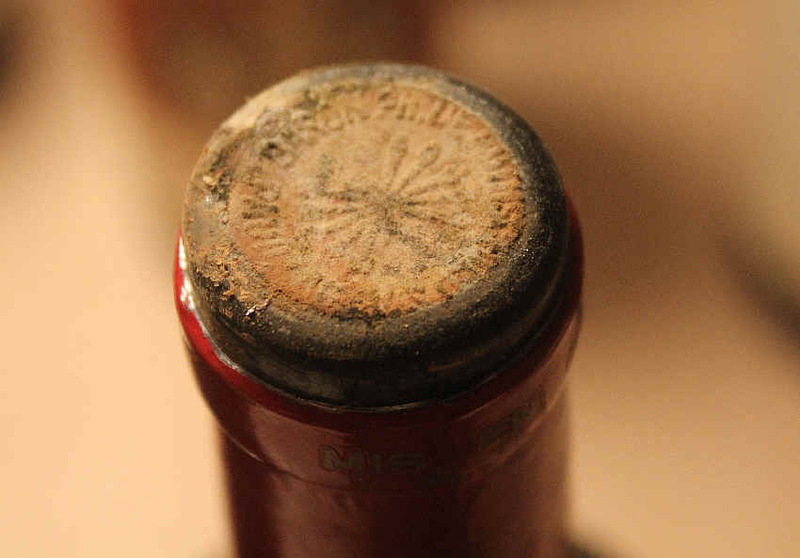 Still, the problem is described as "corked" even though no cork closure was to blame in this case. If your bottle of wine suffers from this musty character, you'll notice aromas reminiscent of a cellar full of wet newspapers, "wet dog" or a moldy, dank cellar. Sometimes the taint is pronounced and easy to detect. Other times, it's barely noticeable and many tasters cannot detect this flaw. I've periodically asked people at trade tastings to pour me a taste from an alternate bottle. Sometimes they think I'm crazy (I may well be, but that's another issue) as they can't detect the musty character. But typically if they open a second, non-flawed bottle, the corkiness becomes apparent to even the novice taster. There's another related compound called 2,4,6 Tribromoanisole or TBA. It, too, has similarly odd aromas of wet newspapers, dank cellar, moldy towels, etc. At a restaurant, the server or sommelier should pour whomever has ordered the wine what's called "The Say." This is where they pour a small amount of wine for you to say whether or not the wine is acceptable. Once you've accepted the wine, it's yours. 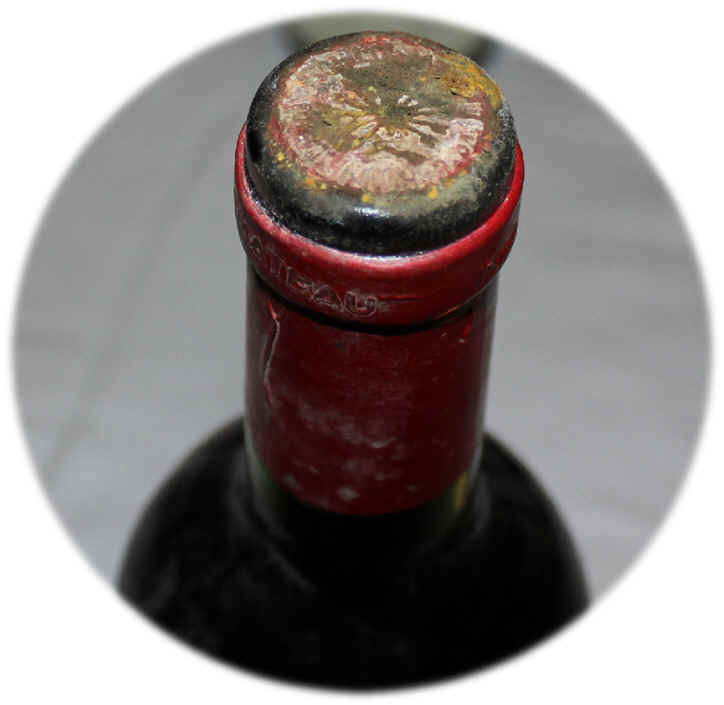 As for a retail shop, we usually have a sniff to verify it's "corked" and we'll gladly swap the "bad bottle" for a new one. I can say, however, the number of corked bottles returned to us is very small and most bottles which people bring back claiming the wine is "bad" are wines which are simply not to the taste of the consumer. One fellow brought back a lovely Chianti which didn't pair well with the buttered popcorn and videos he and the wife were enjoying one Friday night. Another guy asked for a recommendation of a good Merlot, but came back to tell us what imbeciles we are for suggesting such an awful wine. I asked what food was on the table with that Merlot and it turned out they were dining on Sea Scallops! A couple had been so enchanted with a French Burgundy they'd bought, having been smitten by the combination of the wine and the lamb stew they'd prepared. But a week later, having gone out to dinner and not having had wine, they came home, opened the Burgundy and a box of chocolates, finding the combination to be hideous. (Imagine that!) They wanted to return the wine, since it didn't appeal to them when paired with a box of See's Candies. Steak with a Madeira Sauce is sometimes seen on the menu at a fancy restaurant, so one customer bought, without our assistance, a bottle of Malmsey Madeira. He brought it back as being defective, since it "didn't taste good with the steaks we had last night." Of course the combination was a bad one from a gastronomical perspective, but the fellow had simply selected a totally unfamiliar bottle and subjected his guests to an abominable culinary mishap, pairing a sweet, fruity, high alcohol dessert wine with savory grilled steaks! In these instances, it should not be up to the wine merchant or restaurant to foot the bill for the customer's mistake. Put another way: should a winery or wine company have to make good one the bad decision or choice of a misguided customer? Sometimes the answer is yes and sometimes it's no. We hope this page has been helpful in shedding some light on a moderately touchy subject.